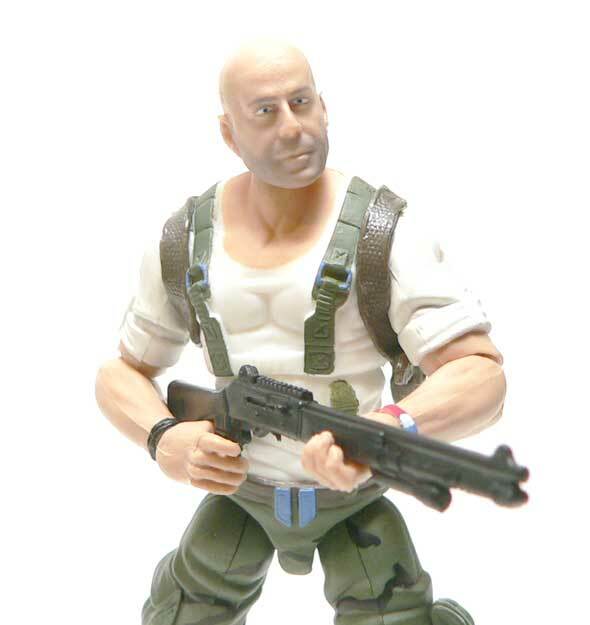 It’s the return of Bruno, as Bruce Willis moonlights from the Die Hard franchise to visit the world of GI Joe as Joe Colton. Joe Colton you ask? Who’s that? 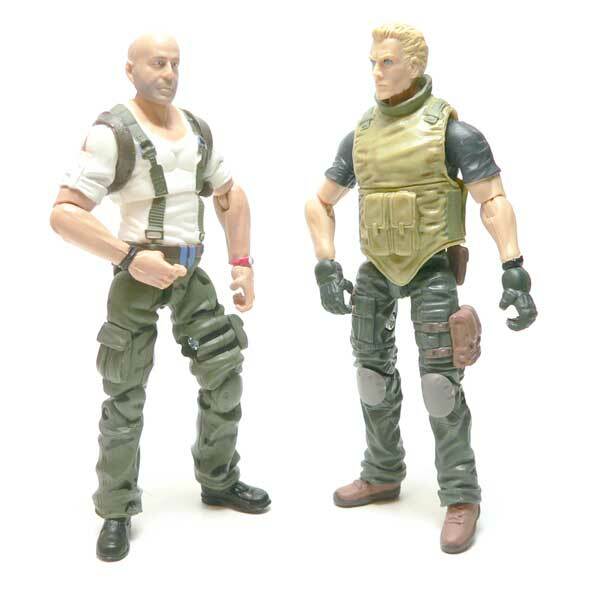 It’s the name given in the Real American Hero (RAH) universe to a character that is an homage to the very first 12″ GI Joe figure. Yeah, I know it’s complicated. But it’s Bruce Effin Willis! Do we really need more of reason to buy him? Obviously, the key to this figure is the head sculpt. I had left this figure on table the other night. When I came home, Mrs. Nerd saw me pick it up and asked if it was Bruce Willis. She thought it was him, but was unsure due to the Rock’s big noggin taking up the top part of the card. If he’s good enough for a non-action figure person to recognize without knowing he was in the film, I’d say that’s pretty good. This is obviously the older Bruce with the shaved head. I have no issue at all with this. I actually even like the way they way they did the 5 o’clock shadow. However, the one real complaint I have about this figure is the eyes. They are just off. Gertie appears to have made him slightly lazy eyed or cross eyed, I’m really not sure which. I think the left one is turned in slightly, but I’m just not sure. Ironically even crazy eyed, he still looks like Bruce. But maybe more of Moonlighting Bruce or Whole Ten Yards Bruce. Speaking of paint, I’m not sure what he’s wearing on his right wrist but it’s pretty sloppy. The left wrist has what appears to be a red, white and blue wrist band. While it’s patriotic, I have to wonder if this is screen accurate. The suspenders are sculpted to the body which leads to a couple of issues. The first of which if the chest joint is off center at all, it really shows. 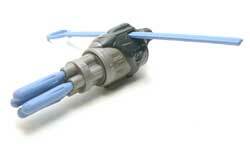 The second issue is that it looks like there is a sculpted strap connecting them right at the chest joint. It’s not painted and looks like some strange piece of his t-shirt. I think we all know that we are going to see customizers doing some things with this figure. As a bonus, they’re going to get one of the cooler pieces of web gear I’ve seen recently, a shoulder holster. It’s completely a separate piece, and looks cool. The gun is permanently in it, but I think for this kind of piece that is an acceptable trade off. While I like the overall look of the figure, I have to say he’s maybe a slight bit more bulky than Bruce normally appears. Of course, this is probably how we all think of him. The main thing is his chest is a bit wider than it should be. 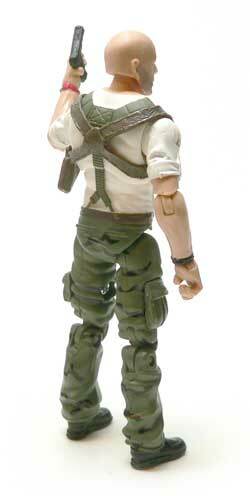 I’m really grateful that this is a fully articulated GI Joe figure. The wrist and ankle articulation are there as well as double jointed knees and elbows. 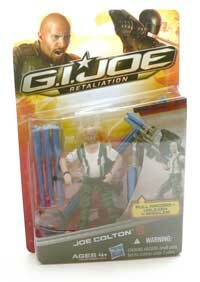 There is no doubt that this is a GI Joe figure. Of course being a movie figure, he has an action weapon. This thing is a huge four barrel launcher. Pull the zip cord and and it the projectiles fly. It’s not the worst thing I’ve seen for sure. His large orange rifle keys into the bottom, but I couldn’t get that to work. Also, there’s an odd ball joint on the back of it that makes me think that it fits on a vehicle or something. Now, you know Joe ain’t going any where not armed to the teeth. In addition to the above weapons, he comes with three standard but solid weapons. The first is a large revolver that I think I got with the HISS Driver. The second is a pretty typical automatic weapon that would be perfect for a John McClane custom. Last up is my favorite, a shot gun. It’s well done, looks in proportion and I have no issues with it one bit. 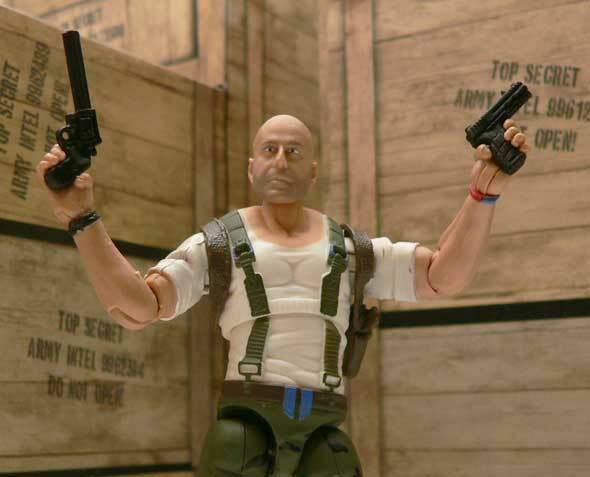 I have Bruce Willis in action figure form on my desk. I am happy. He’s articulated and looks like he should. Are there issues? Yeah. but I’m willing to overlook them. I was expecting something much worse that I still would have bought. Now to find some bare feet and a tank top body…..
Looks like a pretty solid figure to me, even with the close-set eyes. Great review!. Thanks, man! I think it shows when you really love something. Gotta have that periwinkle missile shooter thingy! 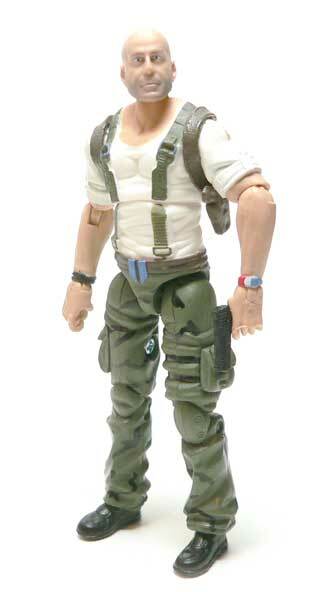 Yeah who doesn’t want a John McLane figure, oh wrong franchise… I meant who doesn’t want a Joe Colton figure yipee ki ay monkey trucker! 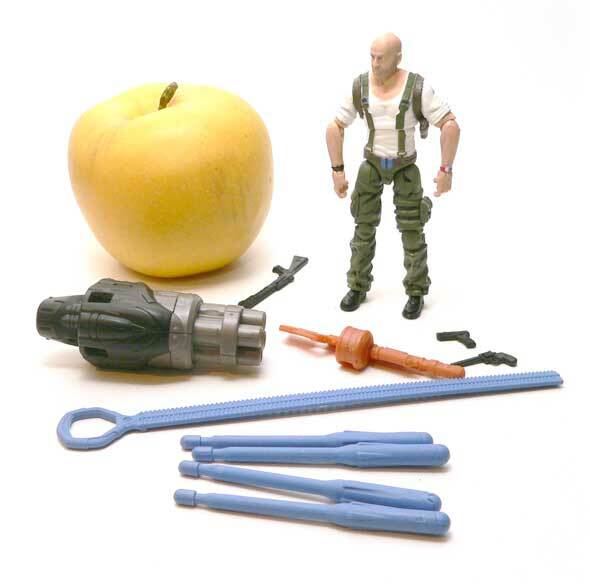 I don’t care what the package says this IS a John McClane figure! And it WILL be mine!! !